Hello Cricut friends! It’s Mariah from Giggles Galore and like you, I am so excited about the arrival of the Cricut Knife Blade. I’ve been playing around with my Knife Blade for about a month now, and I've been having lots of fun trying out all kinds of new projects and materials, it's amazing what this new tool can do! Today I thought it would be fun to talk all about the different kinds of cool materials you can cut with the Knife Blade. The Knife Blade was specifically designed to cut thicker materials that cannot be easily or successfully cut with other machines or blades. But, before we talk materials and projects there are a few important details we need to discuss. First, the Knife Blade is for use with the Cricut Maker™ only and requires the use of Design Space® software on a desktop or laptop. Second, when using the Knife Blade it is not recommended for cutting images or details smaller than ¾”. Finally, it's important to note that thicker materials require multiple cut passes with gradually increasing pressures to cut through successfully. This means that Knife Blade cuts will take significantly more time than when you are cutting thinner materials with other blades. The duration of the cut will vary depending on the size and intricacy of the images being cut, so make sure you remember to plan ahead and be patient. * Basswood, up to 1/16"
With all of these fun materials the possibilities for party decorations, home decor, and gifts are endless. Let's take a closer look at some of my favorite materials and what you need to know before you begin. 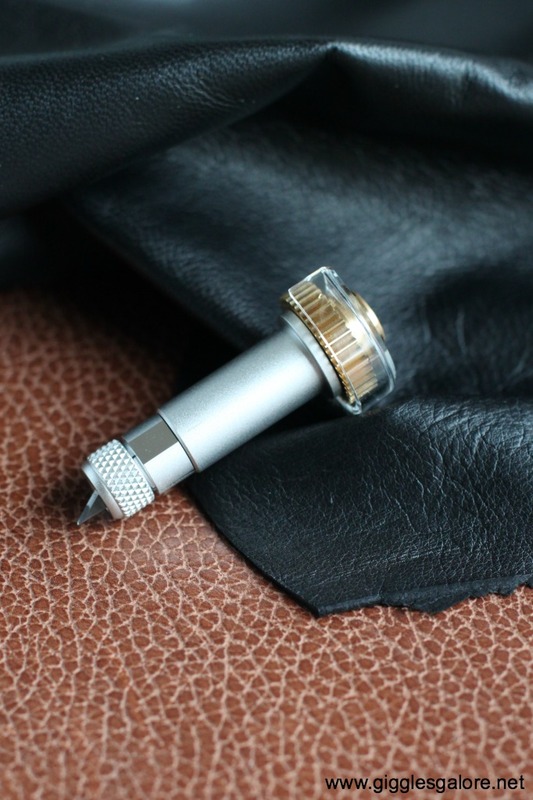 The Cricut Knife Blade can be used to cut both garment leather and tooling leather. What's the difference you ask? Garment leather is often softer and more flexible than other types of leather because it has been treated with softeners. Cricut offers a variety of garment leathers in 12" x 12" sizes. Tooling leather is stiffer and may have patterns or designs worked into the leather using leather tools. The key is to look for leather with a uniform even surface. When cutting leather you need to use a StrongGrip mat and use a brayer to create a firm bond between the material and the adhesive surface. Be sure to tape down all four edges of your material to the mat, blue painters tape works great. 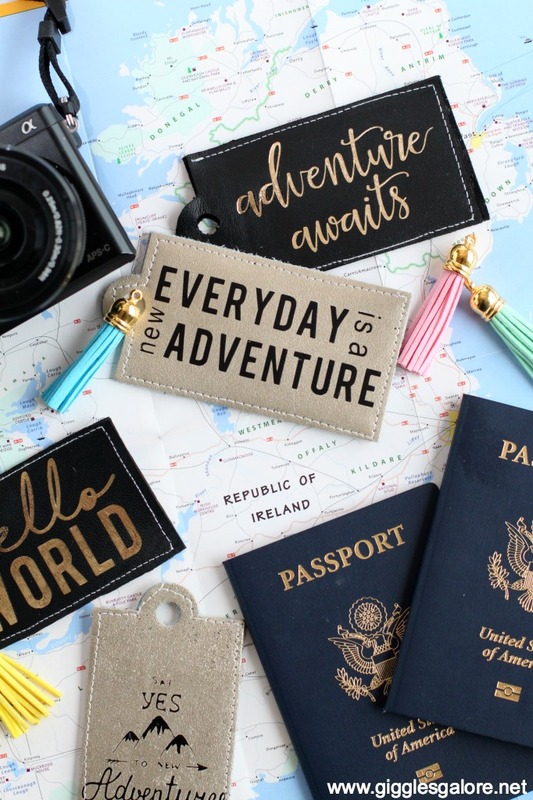 I made DIY Leather Luggage Tags with both the Cricut garment leather and tooling leather and they both cut beautifully with the Knife Blade. This is one of the materials I couldn't wait to try with the Knife Blade. I think this is one of the most versatile materials that can be used for everything from custom cake toppers to home decor. I just know you are going to love creating projects with chipboard so let's talk about what you need to know before you get started. The Knife Blade works with 2 mm Cricut chipboard, which is made of high-grade materials and specifically designed for use with the Knife Blade. The maximum size of cut for chipboard projects is 10.75" x 10.75" and the cut can't be smaller than 3/4". Just like the leather you need to use a StrongGrip mat and tape the top and bottom edges of the material to the mat. Once it is done cutting, before you remove the mat you will want to examine your project by pulling up a corner or edge piece to make sure all pieces have been completely cut, if not Design Space will allow you to select and add one more cut pass to complete the cut. One of the things I love most about the chipboard is how you can personalize your design for any occasion by covering it in paper or paint. If you plan to paint your chipboard make sure you paint it with an acrylic sealer, Modge Podge or Gesso first. 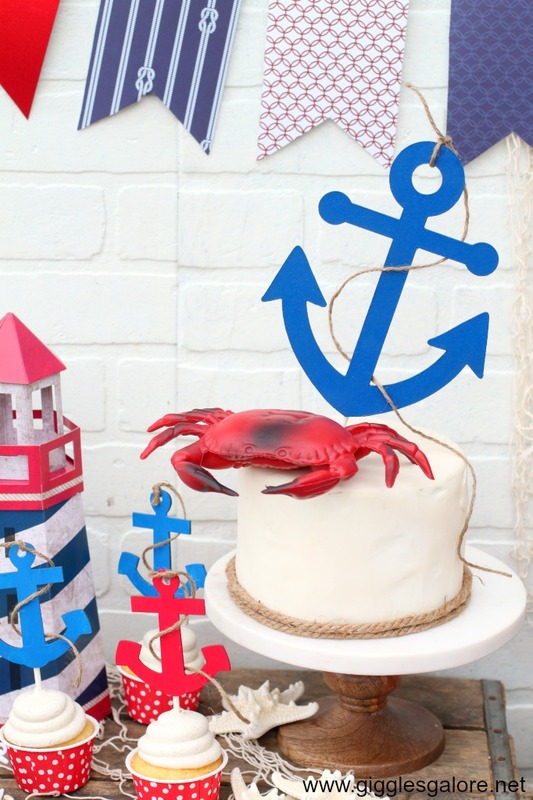 I used one coat of spray paint to finish off this simple patriotic anchor cake topper and love how it turned out. When I first learned about the Knife Blade and heard that you would be able to cut wood my mind was blown. Just like the chipboard, I can see lots of versatility with this material, especially when it comes to creating on-trend home decor. 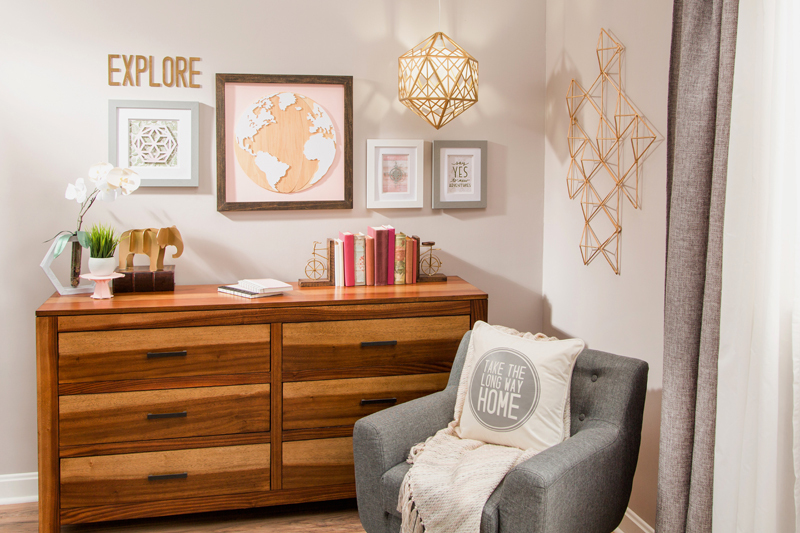 I can't wait to create my own one-of-a-kind gallery wall, just like this one the creative team at Cricut designed and made. Just look at that incredible basswood World Art! Cutting balsa wood and basswood is easy with the Knife Blade, but here are a few important things you need to know. Boards should be single pieces and not composite pieces or pieces that have been glued together. Look for wood with no bow or warp and minimal blemishes like knots. You can purchase and use wood with 1/32", 1/16" or 3/32" thickness. You will want to place the wood on the StrongGrip mat with the grain running either horizontally or vertically and be sure to tape all edges of the material to the mat. In addition to these approved materials, I've also been experimenting with other cool materials including mat board, plastic sheets, cardboard boxes and cork board. What type of materials are you most excited about trying with your Knife Blade? I am so excited about this knife blade because I want to use it on balsa wood or basswood (if I can find it). Do you have any idea as to where I can get the type of wood needed for my Maker that will not damage it? I sure hope you can help. Hi. Craft shops like Michael’s, JoAnn and Hobby Lobby should have some. I have heard that Hobby Lobby has an especially good stock of different sizes and thicknesses. You could also try hobby shops that cater to people who make models, etc. How do you adhere it to the wall? Which project do you mean?